Prasch’s recent session on Counting the Omer is yet another one of his novel teachings. 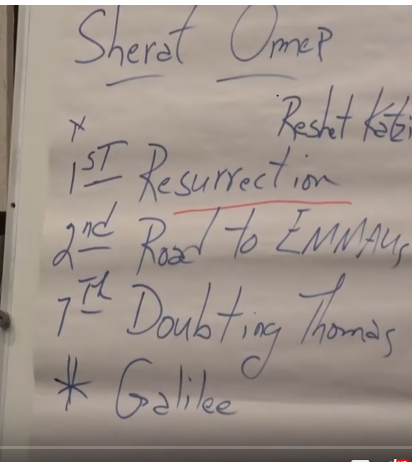 He refers to the Emmaus Road events in Luke 24 as taking place on the second day of the Omera number of times, specifically at 13:20-16:30 and 34:50 minutes into the video, even writing it on his white board. If we simply read the scriptures for ourselves we can very easily ascertain that Prasch is inaccurate. It was the first day of the week, and that very evening, while the disciples were together with the doors locked for fear of the Jews, Jesus came and stood among them. “Peace be with you!” He said to them.… (John 20:18). Prasch proceeds to place Jesus’ revelation to doubting Thomas on the seventh day. (18:00 minutes). However, the scriptures tell us that it was eight days later i.e. eight days after the first day. (John 20:26). Prasch shifts the Emmaus Road events to the second day of the Omer because it is crucial to his argument, or rather, his false eschatological concoction, by linking the Counting of the Omer to the tribulation. For a supposed expert on Judaism, I do not believe it is possible that Prasch has made a simple error! Prasch: “The presence of the Lord in the churches is going to become more scarce as we proceed into the Omer.” (33:00 minutes) WHAT!!! (2 Corinthians 11:4; John 10:10). For where two or three are gathered in my name, there am I among them.” (Matthew 18:20). And behold, I am with you always, to the end of the age.” (Matthew 28:20). Precisely what “darkness” is Prasch referring to in the following statement? “During the Omer they were in a transitional state.. He had not left them yet, the darkness had not come, but he was not around as much day to day as he had been. He shows up ten times on special events on certain days of the Omer..” (33:05 minutes). 19So then the Lord Jesus, after he had spoken to them, was taken up into heaven and sat down at the right hand of God. 20And they went out and preached everywhere, while the Lord worked with them and confirmed the message by accompanying signs.]] (Mark 16: 14-20). Prasch puts all the emphasis on the disciples, but the scriptures say: But their eyes were kept from recognizing him (Luke 24:16). The Greek: but their eyes were prevented (ἐκρατοῦντο) from recognising him. Are there any valid comparisons between the Omer and the tribulation? The tribulation lasts for 3.5 years/1260 days (cut short) and so we cannot compare the two in numerical terms. Prasch refers to “despondency and disappointment” during the “future Omer” (supposedly the tribulation). There was no despondency or disappointment during the Counting of the Omereither in the Old Testament or in the New Testament. The Feast of Firstfruits: it shall be a statute forever throughout your generations in all your dwellings. (Leviticus 23:14). The Omer counts the forty-nine days between the Passover and Shavuot (Leviticus 23:15–16).The Counting of the Omer begins on the second day, not on the first day. In the Old Testament, an omer i.e. a measure of grain, was offered in the Temple on the second day of Passover (Pesach). Pentecost is literally 50 days from the resurrection, coinciding with the day after Pesach, the day of the wave offering. The disciples disappointment and despondency was dispelled on the first day, the day of Jesus resurrection. (Mark 16:10). During the tribulation there will not be despondency and disappointment. For many who are unprepared there will be anger and outright rebellion… many will fall away and betray one another and hate one another. (Matthew 24:10). The mark of the beast will be implemented at some point, after which people will not be able to buy or sell. (Revelation 13:17). I think it will be too late for a “crash course” in bible prophecy. Believers will suffer terrible persecution and be put to death. (Matthew 24:9). After the Antichrist is revealed at the mid point of the 70th week of Daniel, things will change for the worse very quickly! (Matthew 24:9). The bible talks about it being too late for the foolish virgins with no oil. (Matthew 25:1-13). None of these events prophesied by Jesus Himself fits into an Omerscenario! Moriel Scottish Conference title: Work while you have the light… “for night is coming when no one can work.” The verse: “WALK while you have the light..” (John 12:35). So Jesus said to them, “For a little while longer the Light is among you. Walk (περιπατέω) while you have the Light, so that darkness will not overtake you; he who walks in the darkness does not know where he goes. (John 12:35). περιπατέω = I walk, hence Hebraistically (in an ethical sense): I conduct my life, live. 1As he passed by, he saw a man blind from birth. 2And his disciples asked him, “Rabbi, who sinned, this man or his parents, that he was born blind?” 3Jesus answered, “It was not that this man sinned, or his parents, but that the works of God might be displayed in him. 4We must work the works of him who sent me while it is day; night is coming, when no one can work. 5As long as I am in the world, I am the light of the world.” 6Having said these things, he spit on the ground and made mud with the saliva. Then he anointed the man’s eyes with the mud 7and said to him, “Go, wash in the pool of Siloam” (which means Sent). So he went and washed and came back seeing. (John 9:1-6 cf. John 4:34). This is what we are up against with Prasch… he cleverly replaces just one word scripture and tags on half a verse – he then integrates it into his demonic end time teaching! I do appeal once again to Prasch’s followers to be Bereans for their own sakes. (Acts 17:11). This entry was posted in Deliverance, Doctrine, False Teachers, Theology and tagged Apostasy, Deception, Discernment, Doctrine, end of the age, Eschatology, false doctrine, False Prophets, False Teaching, Jacob Prasch, Moriel Ministries, Second Coming by Mike Rogers. Bookmark the permalink. Prasch clearly places the first day of the Omer as resurrection day. His point is that the Emmaus Road events happened on the second day, but they actually happened on the same day. Most scholars place the first day of the Omer as the resurrection day. The day after the Sabbath of Passover is the Sunday of the wave offering, on the Feast of Firstfruits from which the “counting of the Omer” began that year. When one adds one day to the 49 days (7 weeks of weeks) in accordance with Leviticus 23:15 – on the year that Jesus went to the cross and rose – that year, Pentecost fell on a Sunday. The Passover would have either been on the Thursday or Friday. So then the Sunday (first day of the Jewish week, day of the resurrection) could have been the 2nd Omer? Thank you Treena, I listened to all but the last 3 or so minutes of this and I was googling the omer and what he was saying was just so confusing and never giving any scripture reference that would have tied the two together in some way….other than the way he was forcing it. Your article brings much clarity and hopefully will save many from the confusion he causes. Thank you for sharing. God bless you both.